I've used a few different techniques for embedding source code in this site over the years. Here's another one - this time taking source code directly from your github repo. 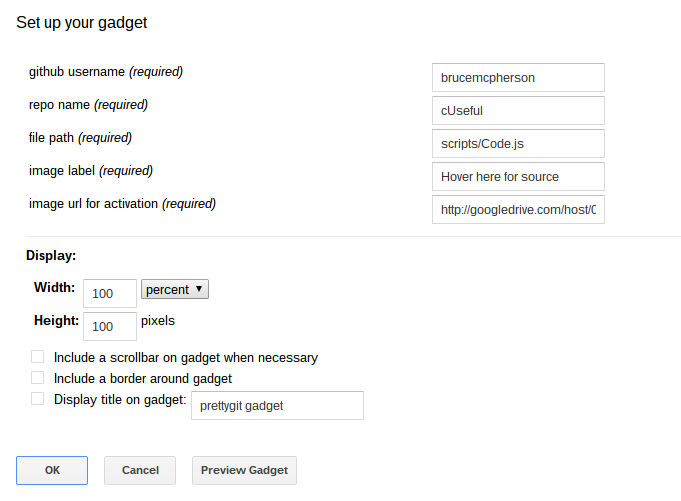 As in Embedding feeds in google sites and Displaying analytics data on site pages I'm using a dynamically resizing one. Like this your pages aren't clogged up with endless pages of code since they reveal when you hover over an image. Here's an example below - just hover over the image and you'll get the code for this gadget. The downside of this approach though is that you have to use the up down arrows to navigate through the source since moving your mouse away from the source code hides it. So clicking on the source while it's visible will lock it in position so it's just like normal page content! Clicking on it again will unlock it. The hosted address for my version this gadget is as below. You can use it or copy and make your own. To insert, go to insert/..More gadgets and insert by URL.